Location: Redcar and Cleveland, North Yorkshire, England. 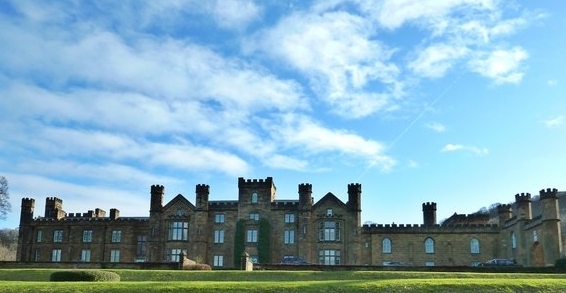 Notes: Wilton Castle is an early 19th-century mansion, built on the site of a medieval castle, now converted into luxury residential apartments, situated at Wilton, in Redcar and Cleveland, England. It is a Grade II listed building. At the time of the Doomsday Book the estate is recorded as held by Nigel on behalf of Robert Earl of Morton. John de Bulmer and the Bulmer family became lords of the manor of Wilton but it isn't until towards the end of the 11th century when the Bulmer family are recorded as building a wooden manor house on the land. In 1170 Sir Ralph de Bulmer received a royal charter confirming his ownership of the estate. King John granted William de Bulmer a licence to fortify their manor house in the year 1210. This would mean building in stone and marks the beginnings of the original castle as a fortified residence. In 1330 a Sir Ralph de Bulmer obtained a charter of his desmesne from King Edward III acknowledging his ownership of the estate. Sir Ralph carried out further alterations to the building and obtained a licence to crenellate from King Edward III allowing him to make the manor house into a castle. All estates including Wilton estate were forfeit to the crown following the attainder and execution of Sir John and Lady Bulmer on 25 May 1537, for high treason under the 1534 Act of Supremacy, arising out of their part in the Pilgrimage of Grace, in protest against King Henry VIII's break with the Roman Catholic Church. The manor was later restored to their nephew, Sir Ralph de Bulmer (d. 1558) by King Edward VI in 1547. In 1558 Queen Mary I granted the estate to Sir Thomas Cornwallis and the estate passed via his son and grandson to his great-grandson Lord Charles Cornwallis in 1698. Lord Cornwallis sold the estate in the early 1700s to Sir Stephen Fox. Sir Stephen's son by his second marriage was created Earl of Ilchester in 1747 and sold the estate the next year. The estate was purchased by the trustees of the will of a Robert Lowther for the benefit of (Sir) James Lowther (1736-1802), member of Parliament (1757-1784). Sir James Lowther became the first Earl of Lonsdale in 1784 and with his death in 1802 the Earldom of Lonsdale became extinct.